It’s every rock musician’s dream to hit the big time, right? Sign a lucrative record contract. Go on world tours. Fight off groupies. And someday, with a little luck, find yourself on the cover of the Rolling Stone. That may be the stereotype, but it’s not every musician’s fantasy. What Glenn Mercer cares about is his music. Expressing himself. Having a creative outlet that gives him (and lots of others) enjoyment. When Glenn’s band, The Feelies, plays at The Sinclair in Cambridge this Friday, Boston music fans will have the opportunity to hear what that perspective translates into. The Feelies’ brand of highly energetic, polyrhythmic thought-rock, replete with dueling guitars that mix as beautifully as vermouth and gin, is 100% original. Their songs, built on an evolved garage-band base that swoops to dizzy heights of complexity and, at times, all-out frenzy, are in many ways the progenitors of the indie rock movement that has followed. But Friday’s show isn’t going to be a history lesson. It’s going to be a blast. Mercer and the band’s other members have been making and playing music for decades. The Feelies’ first album, Crazy Rhythms, was released in 1980. At that time, they were youngsters playing to wildly enthusiastic audiences in New York and on their native soil in northern New Jersey. Feelies shows at Maxwell’s in Hoboken were affairs of state, where the band’s faithful (from both sides of the Hudson) gathered to pay homage to the coolest sound they’d ever heard. The Feelies didn’t play classic rock. They didn’t play punk. Or new wave. Or no wave. Or any of the other splinter genres that were in various states of germination at that time. They just took to the stage, looking more like a college debate team than a rock band, and played Feelies songs. Their fans couldn’t get enough. But the band’s original cast didn’t stay together. Despite the rave reviews the band received almost from the beginning, Crazy Rhythms didn’t sell as well as it deserved to. And The Feelies weren’t keen on playing night after night just to promote record sales. 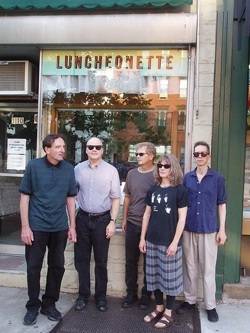 Two of the band’s members eventually left to do other things, while Mercer, rhythm guitarist Bill Million and drummer Dave Weckerman veered off into other directions themselves, first in the form of a Mercer-Million offshoot band called The Willies and later all together with The Trypes, where they teamed up with current Feelies band members Brenda Sauter (bass) and Stan Demeski (drums). In 1985, these five re-formed The Feelies and released a new album, The Good Earth. A somewhat quieter and more reflective album than Crazy Rhythms, it was another potent demonstration of the band’s interest in layering together progressive patterns of rock sound. Three years later, another record appeared, Only Life, and in 1991 Time for a Witness came out. The band, signed by then on A&M Records, was soon playing to bigger audiences and even did a tour with Lou Reed. But in the summer of 1991, with members of the band starting families and the rigors of being a 1990’s rock band taking their toll, Million lost interest. He packed up and went to Florida and the remaining band members moved on to other pursuits. Seventeen years passed. The idea of reuniting had been discussed periodically. But it didn’t gel until one day when Thurston Moore of Sonic Youth talked to Mercer and Million about getting The Feelies back together for a very special show. He wanted them to open for Sonic Youth at New York’s River to River festival in Battery Park. The guys agreed to do it. To prepare, Mercer, Million, Weckerman, Sauter and Demeski returned to Maxwell’s, where they made magic all over again in the form of four sellout shows. The Feelies were back. Since then, the band has continued to perform sporadically, mostly in the northeast. In 2011, they released an album of new material, Here Before, which picked up right where their earlier records left off. Its tight, exuberant songs have introduced a whole new generation of fans to their music. For his part, Mercer is glad that the group’s back together. This Friday, The Feelies are coming back to Boston—albeit a few months later than planned. They’d been scheduled to perform on April 19th, that dark day during which the city stood still for 18-plus hours. The search for alleged Boston Marathon bomber Dzhokhar Tsarnaev had not only brought life in Beantown to a halt, it had led to the cancellation of The Feelies’ scheduled show, as well. Five months later, Boston finally gets it chance to reacquaint itself with this immensely talented group of musicians. If you’re planning to go, I suggest you get your tickets well in advance. Feelies shows routinely sell out. What can you expect on Friday? Somewhere between 2 ½ and 3 hours of scintillating rock with Demeski driving the drums, Sauter pumping out the bass line, Weckerman banging away on drums, triangles, wood blocks and anything else that isn’t nailed down, and the magically intertwining guitar work of Million and Mercer. Don’t expect a lot of chit-chat between songs, though; The Feelies are first and foremost committed musicians. They don’t so stand-up. It’s nothing personal—they’re just trying to put on a great show. In this interview, which was conducted a week before the show, Glenn Mercer talks about the band’s beginnings, playing The Feelies’ first-ever show at CBGB’s, how rewarding the band’s reunion has been to him personally, and how much he’s enjoyed reconnecting with the band’s fans—and making new ones. You may already be one of them. If you’re not (yet), I guarantee you will be if you attend Friday’s show. Get your tickets and event info HERE. Listen to the interview with Glenn Mercer HERE.